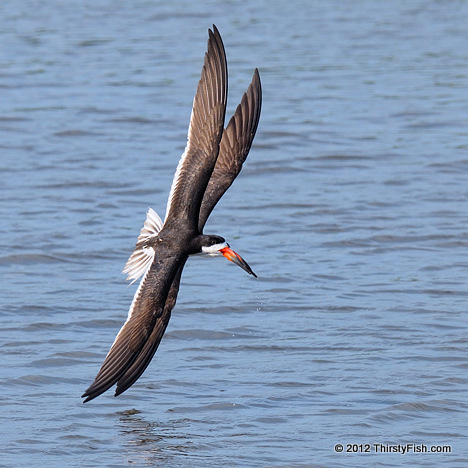 Black Skimmers fly gracefully. This couple was displaying their formation flying skills. Both their wingtips are barely an inch off the water. Someone asked me the same old question again: Why are you interested photography when you do not earn a living from it? This time, I avoided answering directly. But on second thought, I realized that this question was really a question of potential. Not everyone with a camera is asked this question; only the ones that have some sort of skill, talent or potential to turn their respective interests into financial success or social recognition. In the United States, the words success and successful have taken the wealth, position, honors connotation. We measure how successful people are, primarily through how much wealth that they have accumulated, with the assumption that wealth brings happiness, freedom and balance. Well, I can tell you that wealth does not necessarily bring happiness, and often leads to mental captivity. Yes, we do need a sufficient amount of income and wealth to function, but happiness is more a state of mind. For example, United States, the richest country in the world, ranks 150th of 178 countries in human well-being according to the Happy Planet Index. If success is not really proportional to wealth or status, then how should it be defined? Many religions of the world and philosophies have emphasized the knowledge of oneself. For example, Buddhism teaches that "suffering is caused by craving and liberation is through the elimination of craving". Although eliminating craving at first seems paradoxical, it is not. We incorrectly assume that progress comes from craving, but as writer, artist and philosopher Elbert Hubbard put it, "progress comes from the intelligent use of experience". Success is a measure of how intellegently we live each moment of our lives.